Contains 477 Genera and 4158 accepted taxa overall. Asteraceae is the largest family in Magnoliophyta (flowering plants). It includes about 23,000 different species. Just in Europe there about 4,000 native species. Daisies, aster, and sunflowers are some of the most popular flowers in this family. There are a few subfamilies that are sometimes included in Asteraceae, including Lactuceae (dandelions, Sowthistle, lettuce). All the flowers in Asteraceae have star-shaped heads. Each plant has one or both types of two flower heads. These two types are disc floret and ray floret (both at right). The ray floret has florets possessing a long strap-like petal (ligule). The inner part of the disc, or flower head, is made up of small flowers with tubular corollas, these are disc florets. Asteraceae reproduce sexually frequently assisted by Bees and other insects. As the insects collects pollen or nectar from flowers, the pollen grains stick to its feet, which are then transferred to other flowers promoting cross-pollination. These flowers live in about any climate, although most live in temperate artic/alpine, tropical, and subtropical climates. Ultimately they live in large quantities anywhere except tropical rainforests. 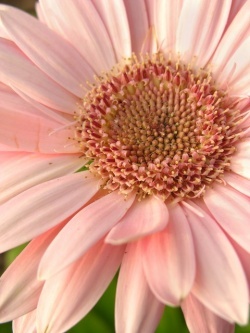 Asteraceae are extremely popular in gardening and bouquets. Many, many flower bouquets include daisies, aster, and sunflowers, all of which are Asteraceae. Gardens everywhere include these same flowers. All to say, these plants are very popular as ornamentals. This page was last modified on 11 September 2010, at 22:19.